On Saturday night 4/7/07 Black Label Society was the headlining band to play at the Pearl Room in Mokena , IL after the band Sanctity rocked out the house. Now this was my first time seeing BLS live after hearing numerous albums, and of course, being an Ozzy/Black Sabbath fan for going on about 20 years, and I have to say they were amazing! Zakk Wylde is definitely a guitar genius, and not only does he play lead guitar in his band BLS, but he also does the vocals for the band. 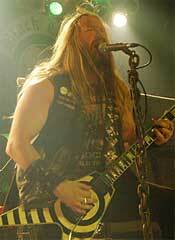 Zakk Wylde formed BLS in 1999 and the band has released 9 albums to date. The latest album BLS is touring for is "Shot To Hell," but during the show they only played a total of about 3 songs from their newest album, which, was released in late 2006. After the band Sanctity leaves the stage, and of course the typical set change follows their departure, an announcer takes center stage and announces, "All praise the almighty Black Label Society!" The crowd went wild with cheers and chants, making it very clear as to why the small venue is packed practically to the ceiling with people. I could also tell from the crowd's enthusiastic cheers and show of devil horns that this was going to be a show to remember. I would not want to bore any readers with reminiscing on the shows entire set list played (17 songs total not including all the acoustic guitar work solos that occurred), but I will recap some highlights from some of the songs played from the show. During BLS's 4 th song "Suffering Overdue" off of the album Blessed Hellride, Zakk ends the song with the opening guitar riff from the famous Black Sabbath song "Iron Man." He then played the song "Funeral Bell" off of the same album (Blessed Hellride) and the entire crowd sang along for this song as Zakk not only sings, but also plays his Spider guitar vertically with wicked finger speed. During the song "Suicide Messiah" off of the album Mafia, the crowd really got intense and some major crowd surfing started to happen. At the end of the song, Zakk toasts a beer to the crowd and screams "How are you doing out there? You can't build the foundation of a house without the rock!" This is when he changed guitars and sat down for a very lengthy acoustic guitar solo. Every member of the band left the stage and Zakk pours out guitar riffs that his fingers make the guitar itself sing without any of his vocals, and which sounded very Jimi Hendrix guitar style in their melodies. At the end of this acoustic jam he played guitar riffs off of Ozzy Osbourne's songs "Diary of a Madman" and "Mama, I'm Coming Home." He also played the entire song "Blood is Thicker Than Water" off of the Shot to Hell album completely solo before the band came back out. After all of this excitement Zakk got very serious and talks about Dimebag Darrell and the last time he saw him. The crowd starts chanting "Dimebag, Dimebag, Dimebag." and Zakk plays another acoustic song in his memory off of the album Sonic Brew called "Another Spoke in the Wheel." Of course the band played the song "Stillborn" off of Blessed Hellride at the end of the show, but the real surprise came with the last song BLS played for the evening. Who would ever guess that a metal king of rock and roll guitar would play the song "You Are So Beautiful" by Ray Charles to end a show? Regardless of the last song choice played, BLS left the stage on a good note, and to cheers of "Black Label Society, Black Label Society." from the crowd. 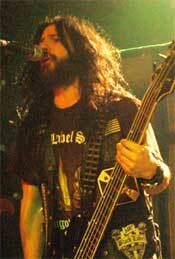 I will have to say that overall after the show my impression of Black Label Society is that it IS Zakk Wylde! This is not saying that his band members did not contribute to the awesome show played, but it is saying that Zakk is the one who had the crowd engaged in every song, and throughout the entire performance. This show was also the last on their tour in the USA before playing in Russia , London and Europe as a special guest act for Ozzy Osbourne. If Black Label Society goes on tour again, I highly recommend you seeing the show, and I would also like to encourage metal fans everywhere to buy their latest album "Shot To Hell." For more information on BLS please visit the following sites: www.Blacklabelsociet.net , myspace.com/blsnet or www.zakkwylde.com.